Formally a 55-day challenge, this program is for women who are sick and tired of being physically and/or emotionally unwell, and women who are sick and tired of not feeling good enough about themselves. It has been specifically developed to supercharge your personal relationship with yourself. It is for women who crave more love and more joy in their lives. It is for women who want a richer, juicier and more fulfilling life and more fulfilling relationships with others. Imagine falling in love with yourself and starting to value yourself in a way you have never known before. What sort of a difference would that make to you? 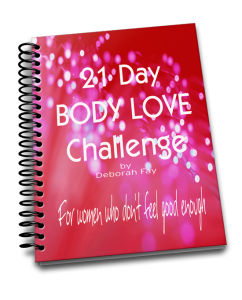 I encourage you to join me on the 21-Day Body Love Challenge. There is no diet to worry about and no one is going to be testing you, or making you feel inadequate. You will be gently encouraged to shift your focus toward a more positive and supportive perspective through daily email prompts and links to extended audio affirmations. You will be given the choice between a printed journal or an e-journal which you will use daily to practice your new thought patterns. You will be invited to join a private online community, where you will have the opportunity to connect with a supportive circle of women, including me, who also want to learn to love themselves more. I encourage you to join us now for this wonderful program. You can get started right away. Just click on your choice of journal below and get ready for positive change.